Three cheers for cherries! 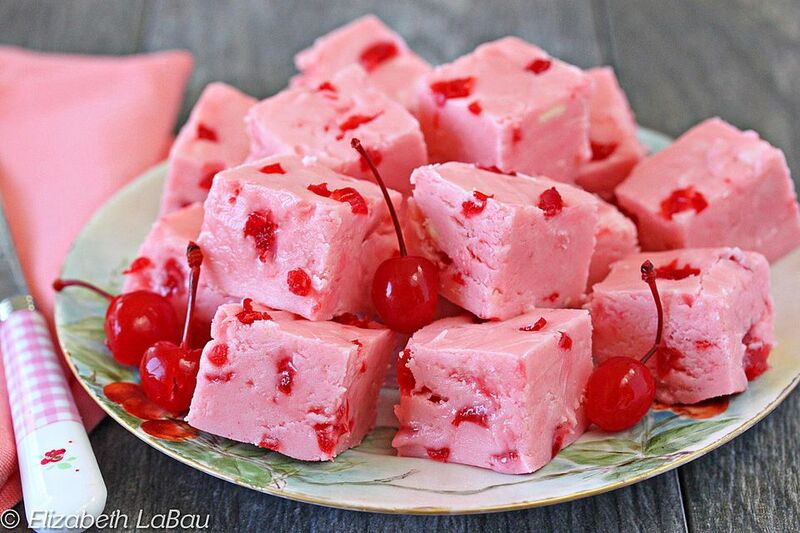 Cherry Chip Fudge is a smooth, creamy fudge packed with cherry flavor, and loaded with bits of maraschino cherries! This fudge is great on its own, or try dipping it in chocolate for a chocolate-covered cherry treat! About 30 minutes before making the fudge, finely chop the maraschino cherries. Place them between thick layers of paper towel, and press well to remove as much moisture as possible. Having moist cherries will make your fudge gooey, so try to get as much liquid out as possible. Place the butter, sugar, cream and salt in a heavy-bottomed medium saucepan over medium-high heat. Stir until the sugar and butter melt. Once the mixture comes to a boil, insert a candy thermometer. Continue to cook the fudge, stirring frequently, until it reaches 235 F on the candy thermometer. Once at the proper temperature, remove the pan from the heat and add the white chocolate chips and the marshmallow cream. Stir vigorously until the chips and cream are melted and incorporated. If necessary, return the fudge to the heat for brief periods to melt the chips. Add 1/2 tsp cherry extract and the pink food coloring. Stir, and taste the fudge. Add additional cherry extract if necessary, to get a strong cherry flavor. Add the chopped cherries and stir well. Pour the fudge into the prepared pan and smooth it into an even layer. Let the fudge set at room temperature for 3-4 hours, or in the refrigerator for 1-2 hours. To serve, cut it into small 1-inch pieces. Store Cherry Chip Fudge in an airtight container at room temperature for up to one week or in the refrigerator for up to two weeks.